Most people I know can talk about players on DC sports teams with great familiarity. Sure I’ve heard about National’s players like Ryan Zimmerman and Stephen Strasburg, but beyond that I am fairly clueless. On the other hand, I am happy to discuss local chefs with confidence. My knowledge retention may be slipping with age, but somehow this doesn’t apply to restaurant information. When I read that Mike Isabella was opening a Greek restaurant called Kapnos on 14th Street, I took notice. 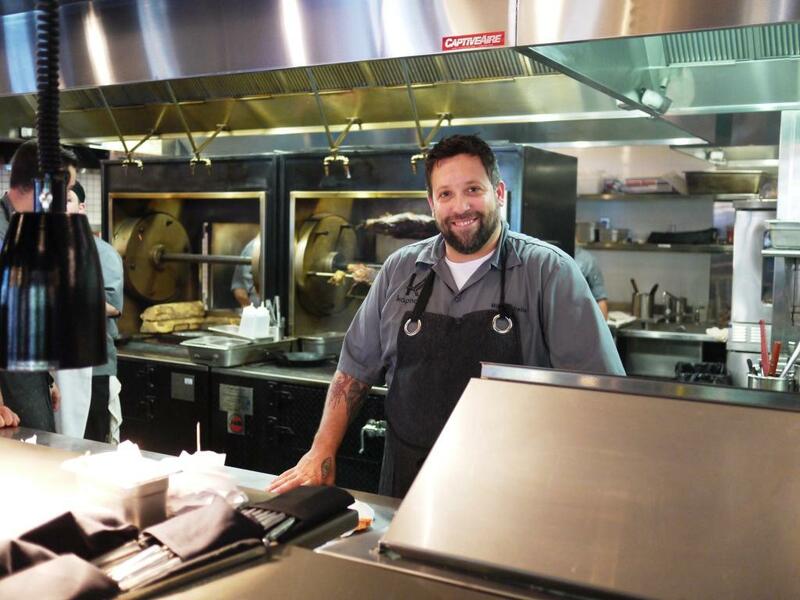 Mike Isabella is the chef owner of Graffiato and the chef/partner of Bandolero in Georgetown. Most people who know anything about DC and food know that Chef Isabella appeared on Season Six of “Top Chef,” and was the runner-up on “Top Chef All-Stars.” I am a fan. While last season most Washingtonian’s worried about pitcher Strasburg overextending himself, I had the same concern about Isabella. Was opening another restaurant so soon on the heels of two others the right move? It is subsequently announced that Isabella is also opening G Grab and Go in Edison, NJ and Sandwich Shop, right next door to Kapnos. I’m willing to give the chef the benefit of the doubt, but wonder if the pacing could be a little slower. I didn’t want to wait long before trying Kapnos, so my husband and I venture downtown the night after the restaurant opens to the public. At 6:00 pm on a Saturday night, Kapnos is already busy. Luckily there are still seats available. I have some idea of what to expect from the decor, thanks to previews from Eater DC and BrightestYoungThingsDC. Much of what I know about the food comes from the Kapnos website. Isabella draws inspiration from Northern Greece to create a menu of spreads, breads, vegetables and other small plates, including his signature wood-grilled octopus. Two wood-fire grills with rotating spits and a large oven for stone-baked flat breads service the 160-seat restaurant. Guests enjoy carvings from whole animals that have been spit-roasted all day, including lamb, goat, duck, chicken, and suckling pig. Isabella keeps the on-tap theme from his other restaurants going at Kapnos. I’ve enjoyed prosecco at Graffiato and margaritas at Bandolero. Here it’s kegged lemonade. Our server pitches Skinos with watermelon, tarragon, and lemon as a great drink for a hot summer night. My husband’s cocktail of choice is “smile like a doughnut” featuring inhouse bottled Hendricks gin, Idoniko bandy, and house made tonic. I’m surprised he’s ordered something sweet. Don’t be fooled by the name, this potent drink is anything but fruity. The selection of spreads are all appealing, so it’s with some difficulty that we settle on tyrokaftari which combines spicy feta, smoked manouri cheese, and “grains of paradise.” The spread is beautifully adorned with radish, dill, and cracked pepper and served along with piping hot stone baked flat bread. 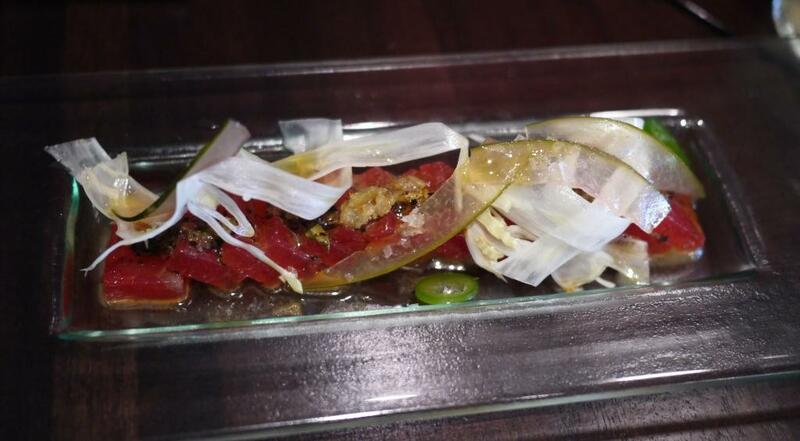 Watermelon from the cold mezze section of the menu, is pickled and accented with ufra chili, rind, and fennel granité. It’s time to toss aside all previous notions of Greek food. These are unique Mediterranean flavors, and after just two dishes we’re almost ready to declare this restaurant a winner. We order the rest of our food all at once, with a promise from our eager-to-please server that they will be not be delivered simultaneously. I should learn never to trust servers who say this, because it’s usually a sure sign that we’re about to be handed a passel of dishes. This is the only service issue we have at Kapnos, and since it’s only night two, we have no cause to grumble. 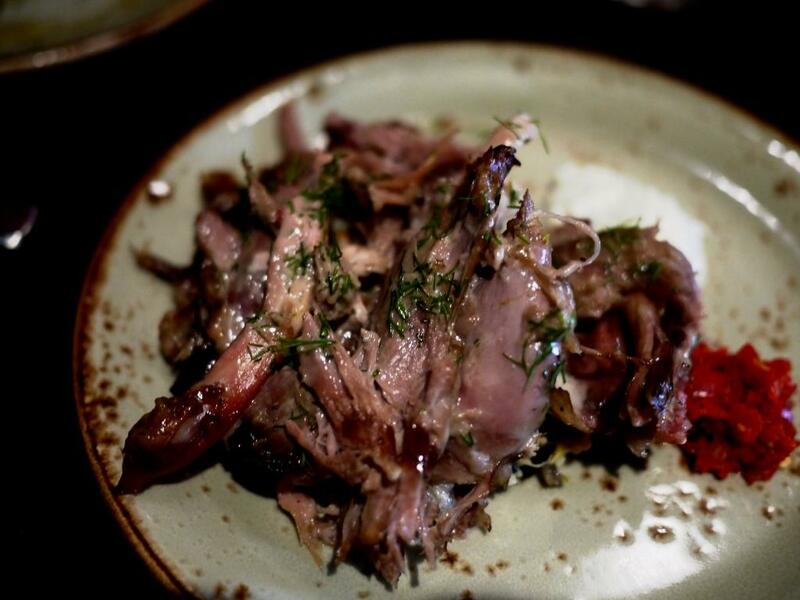 There is no question that my meal will include spit-fired lamb, although meat is only one part of the story at Kapnos. Nearly 60% of the menu features vegetarian items. But let’s get back to the lamb for a moment. It’s a divine plate of tender, juicy slices of marinated spring lamb atop a tangy grain salad and a dollop of mild harissa. 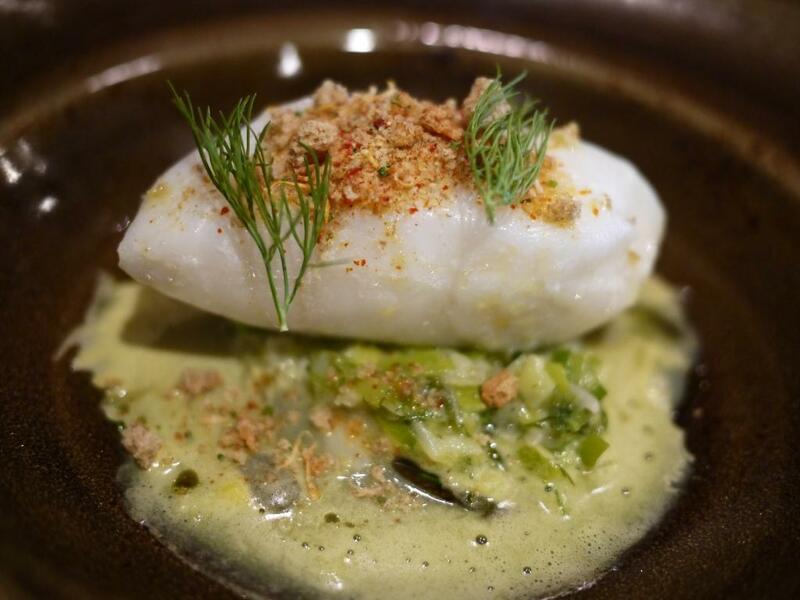 Sadly (wink, wink) I have to eat the lamb by myself, while my non meat-eating husband turns his attention to poached cod with melted leeks, avgolemono, and dako crumbs. I do manage to steal a bit of this fantastical blend of textures and intense flavors. 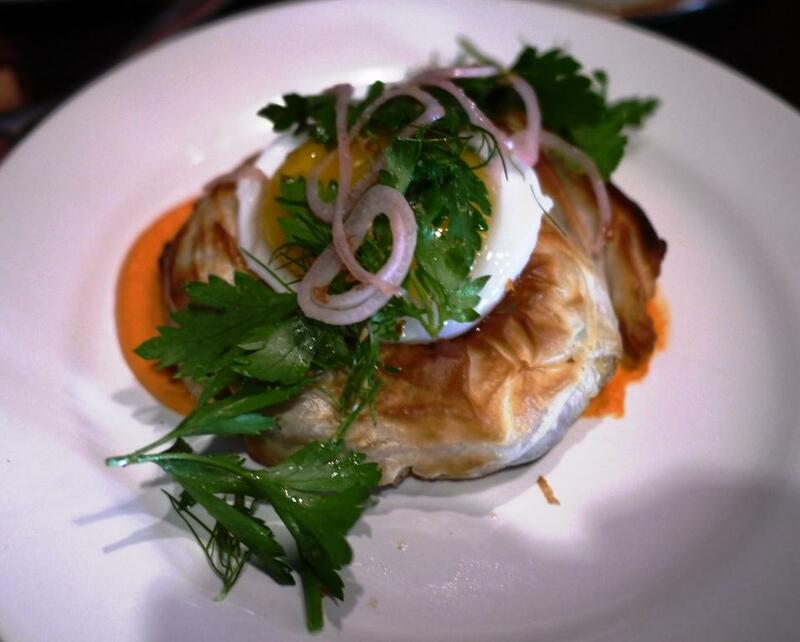 Next up to the plate is a luxurious phyllo pie filled with potato and garlic, and surrounded by red pepper almond puree. My husband is ecstatic about the duck egg perched on top, bringing back happy memories of his favorite Countryman pizza at Graffiato. 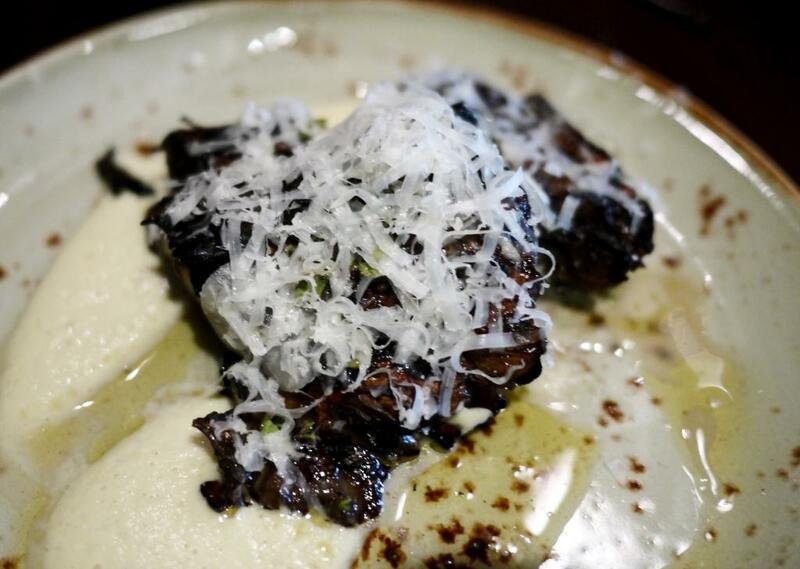 Smoky hen of the woods mushrooms with kolrabi, graviera cheese, and oregano finishes out our array of mezze. This is the one dish that doesn’t register at quite the same level of the others, although it’s competing on a very tough field. Ever since my husband discovered olive oil ice cream at Zaytinya way back when Isabella worked there, he can’t resist its charms. 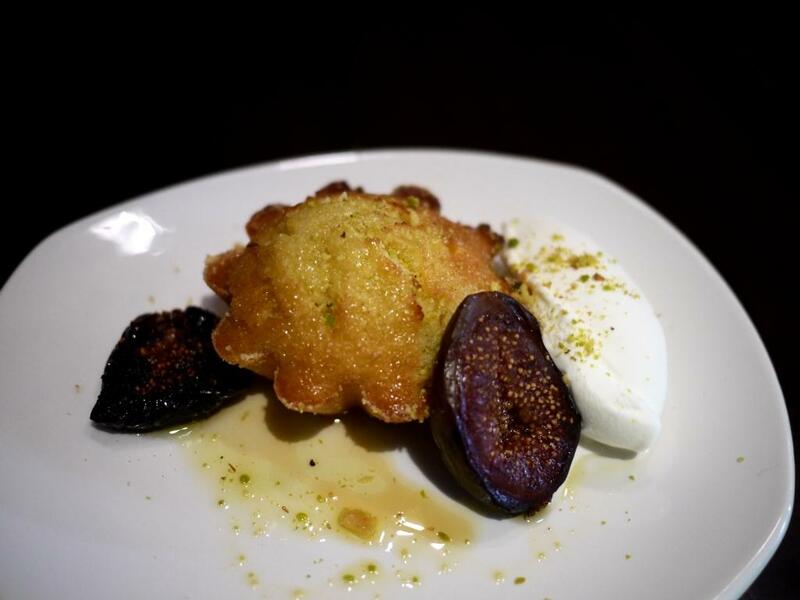 I leave the semolina cake with grilled figs and olive oil ice cream to him, while I enjoy an amply-portioned scoop of smooth apple and ginger sorbet. He insists I try the cake, and it is surprisingly light and beautifully crisp around the edges. Next time…. 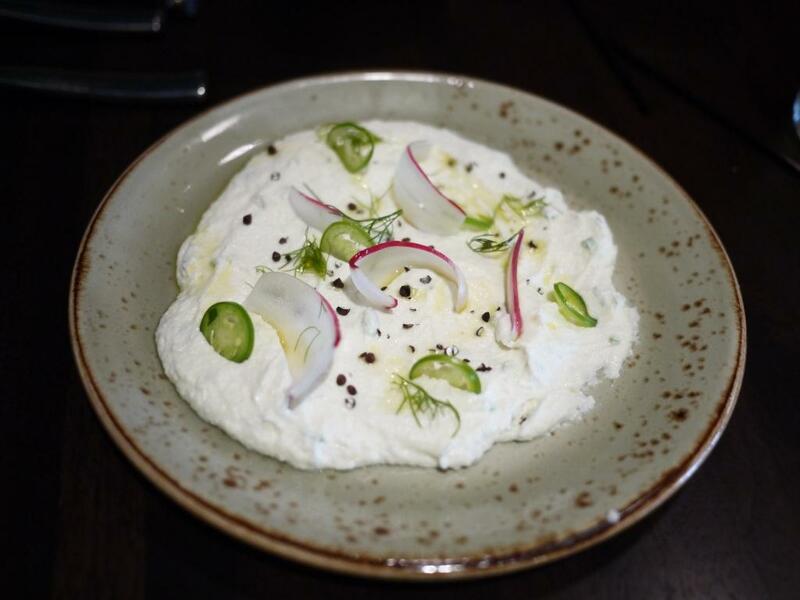 You shouldn’t expect a restaurant to be this good right off the bat, and yet Kapnos is already surprisingly great. Mike Isabella is expertly balancing exotic Greek flavors in dishes both familiar and new. And when it comes right down to it, that’s my kind of home run.